The girls are really digging reference books lately. Ever since my sister (who needs to expand her blog now that the puppies are sold. She’s so stinkin’ creative!!) bought them a horse reference manual for Christmas. 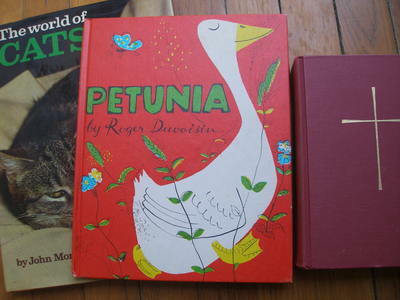 And another children’s book whose illustrations caught my eye; and a Book of Common Prayer for Dan. When we turned into the parking lot this morning and the girls discovered we’d found a new Goodwill store, they squealed with pure joy. You would have thought I’d told them tomorrow’s Christmas. I’ve trained them well. "Mom, if you’ll just let us look at the toys FIRST, I will let you look at all the fabric you want!" She’ll let me?? What a girl. Oh, we used to have those sheets when I was a kid! I would love to make a dress out of them now! The green bucket screams “birdseed” to me. We are forever looking for good containers for our feeder food. I so want to find a good thrift store around here. What a great haul. yes, yes, i am jealous because i don’t have shoes like that. lucky emma! and don’t get me started on those sheets…i never find good ones like that. you are one of the only few people that refer to “chucks” as “chucks”!! (besides all the people in Pgh., maybe its a regional thing). I want to come and play at your house! Your strawberry shortcakes looked delicious, your op shop finds look charming – I love popping into your site! awesome. i love to make things out of sheets- they’re so soft! and my kiddos love reference books, too – we got my 4yo a honkin’ big book about trains for his bday – lots of pictures and he loves it. 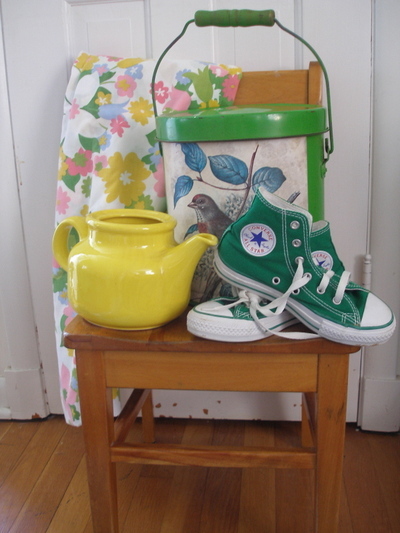 awesome loot!what about using your new little green bird bucket for fabric scraps? you know those little guys too big to throw away and too small to fold back up and return to the shelves…. oh send the bird bucket to me!!!!! What a great haul! I’m jealous! The Goodwill around here never has anything good. 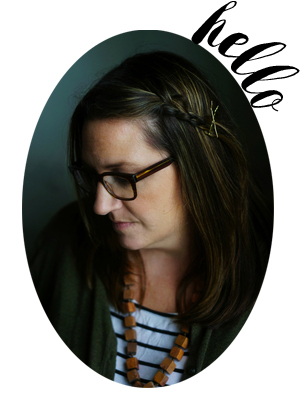 Just found your blog– love your photos and design sense. Beautiful kids! I went to etsy, but it looks like your all sold out. Now I want to go to Good will. that lil deal sounds familiar! sounds like one of the rug-rats that live with me. hehe!